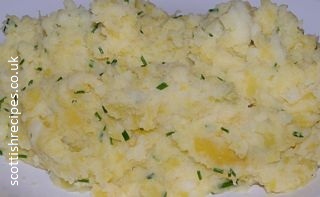 Clapshot is a traditional Orkney recipe of tatties (potatoes) and turnips (neeps - the purple headed orange variety) and is usually served with haggis. 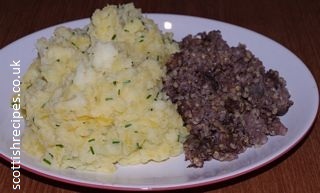 It is sometimes called Clapshaw or Orcadian Clapshot and traditionally made in one pot. The book Scots Cooking: The Best Traditional and Contemporary Scottish Recipes by Sue Lawrence describes the Northern Ireland equivalent as Champ and the Southern Ireland dish Colcannon. Sue Lawrence's Scottish Kitchen: Over 100 Modern Recipes Using Traditional Ingredients has a tasty Clapshot shepherd's pie recipe whilst The National Trust for Scotland book The Scottish Kitchen by Christopher Trotter has a clapshot cottage pie recipe. 1. Boil the tatties and turnip in separate pans and then drain. 2. 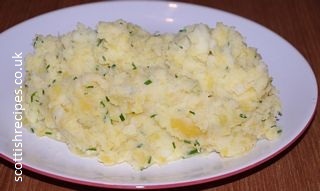 Mash the turnip and tatties together adding the butter. The book A Cook's Tour of Scotland by Sue Lawrence has a Clapshot Soup with Haggis Croutons recipe which uses fresh ingredients or can be cooked with leftovers. The Book Maw Broons Cookbook has a Clapshot recipe which includes the use of additional vegetable ingredients such as turnip and onions. Buy Maw Broon's Cookbook at a discounted price and with free delivery available. The Hairy Bikers' Food Tour of Britain by Si King and Dave Myers has a tasty recipe for clapshot haggis and whisky sauce. They have additional ingredients such as double cream and suggest cooking the haggis in its own juices wrapped in aluminium foil. A Cook's Tour of Scotland by Sue Lawrence suggests using turnips and cooking them for your clapshot recipe in milk for a creamier taste or adding a peeled chopped onion with the potatoes for extra flavour. It also describes the Hagshot Pie that she bought at the Kirkwall butchers Donaldson & Sons. She describes it as a Scotch pie filled with haggis and topped with clapshot.